HomeDo You Want Compliance, Or Brilliance? Do You Want Compliance, Or Brilliance? A few years ago I had the pleasure of working at a company that changed me forever. It was a company where we actually had FUN as a value we sought to live out. Never had I heard of such a thing prior to working here and, frankly, this small town, hard working, no nonsense Midwestern girl was a bit skeptical at first. Fun, whatcha talking about? This is work man and I’ve been working my behind off since I was providing for myself at age 19! The place where you sweat and toil for that check to buy the American Dream! That’s not supposed to be fun. That’s supposed to be hard! I must confess that after a little time of daily inhaling this new culture, I was wooed by this FUN suitor and my hard little no nonsense shell was cracked. And before you know it I was doing crazy things like rolling out the red carpet for new hires (no joking I purchased a red carpet and marched all new hires down it in front of the rest of the staff). And creating limerick contests for staff members to write little ditties to win a game. And playing with Legos and drawing pictures at teambuilding and training events I led. And acting out skits with much humor imbedded to drive home HR lessons in what would otherwise be boring compliance training I led. Heck I even dressed up for new hire orientations. Reality is I got steam rolled by the fun wagon and I have never been the same again. Over the years I’ve studied the virtue of this value of fun on a more intellectual level. Captured above in my photo is a visit to a fish market in Seattle. Some of you may have heard of it. 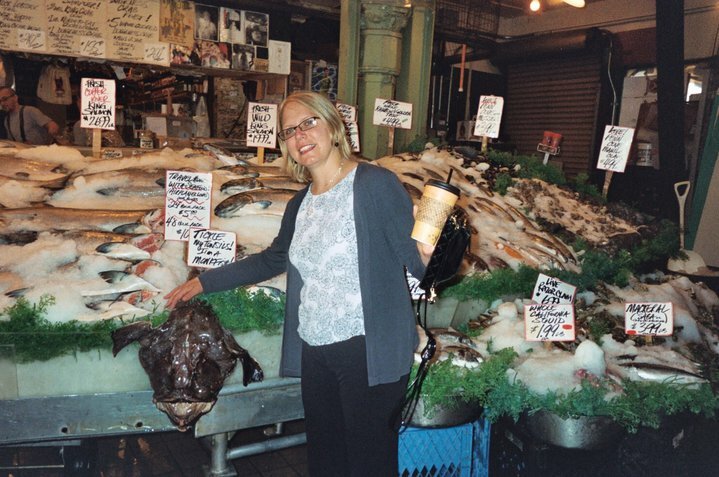 It’s called the “Pike Place Fish Market” and they have become famous for the enjoyable and engaging environment they create for both employees and patrons. From their flying fish http://www.pikeplacefish.com/about/flying-fish-presentations/, to the more serious and empowering virtues they teach about helping people be themselves and be engaged, they just simply get it in my opinion. If you haven’t heard about this group, I would encourage you to study them. They also sell videos and materials for those in the training profession who want to learn about this methodology. So, why the fun? What’s the point? Let me explain the title of today’s blog. It’s in the form of a question. The question is: Do you want compliance, or do you want brilliance? Here’s my point. One can get compliance through many tactics. I once worked in an environment where the almighty handbook was the management team’s end all be all. We could quote line and verse and point out that on the tenth day of the fifth month thou hast broken the attendance command for the third time and as such landed thyself on a final warning. We were hounds about this. And dang it we were good at this stuff, if the measuring stick of good is understanding every rule and crafting write ups to excellence. However, we were good at little more than this. You see, of course rules count and need to be applied and respected. However, if it’s just about rules you are in trouble. One can get lip service and checking off the list with a little fear and intimidation style management. Fire a few people, enforce those rules, get tough and you’ll get a reaction. And frankly given the human condition and some souls in the world who enjoy flagrant defiance of rules, the handbook is a must. But back to my original question. Do you merely want compliance, or do you want brilliance? Compliance is easy. It’s a shortcut. It’s old fashioned. It gets lip service. But if you stay there and there alone you are in trouble because you engage the lips but no more. And this typically leads to high turnover and high disengagement. You see, GREAT companies advance further than compliance. They decide that lip service ain’t enough. They want heart service. They want to tap into the human spirit and unleash something special. They want brilliance. And you go there, to brilliance, by engaging the heart AND mind in a person. You go there by daring to put a little spirit into things. By daring to care. By drawing people into work by getting to know them and getting to lead them in a way that shows you care. To get to this place a leader needs to let down his guard and bare a little soul. Reach out to your employees as fellow human beings. Laugh a little. Love a lot. Throw fish. Write limericks. Roll out the red carpet for people because every person is worth it. Work hard, but be sure to play hard too. Ask them how you can be better, and then listen. Don’t pretend you’re here if you have never asked them. I guarantee you you are not here if you don’t have the guts to ask your employees honestly about the way you’re leading, listen, and be open to personal change.